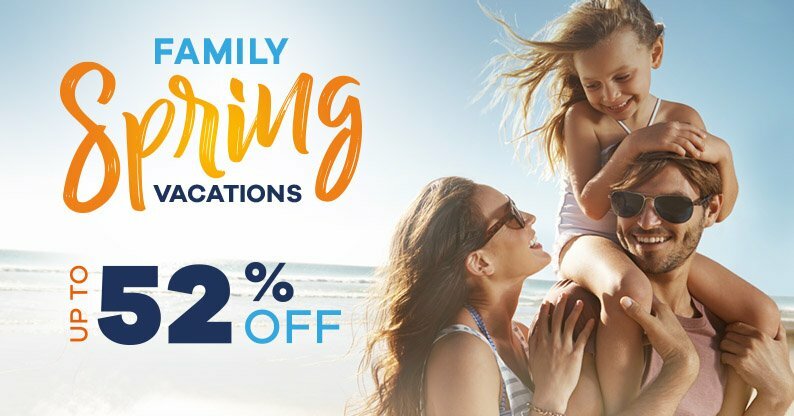 Get up to 52% discount on your resort reservation during this Spring Season and enjoy all the benefits and hallmarks of our Royal Reservations family! Our Resort has a gift for you this Spring, we are giving away up to 52% discount on all reservations! Book your stay and in our All Inclusive Plan. You will have all the benefits of the ultimate vacation experience, always highlighted in our exclusive beachfront resorts. Your satisfaction is our grand priority; so we are making your dream vacation even more available for you and your family. Let all the stress behind and start dreaming on days at the beach under the Caribbean sun! Book in our site for exclusive offers! Resort Credit: The Resort Credit must not be considered as cash money. Is per reservation and it can only be redeemed at the front desk upon chekout. Airport Transportation: One roundtrip transportation in shared service (airport-hotel-airport) is included. Guest must contact Thomas More Travel at least 48 hours prior check in to arrange the transfer from the airport. For the All Inclusive: some surcharges will apply for premium food and beverages; it is indicated on the restaurants menu. Limited Room Service menu avilable 24 hours. Children stay & eat Free: Children up to 12 years old can stay for free using the existing beds, there is no extra beds or rollaway beds available. Children can eat for free accompanied by their parents. Restrictions: The minimum lenght of stay is 4 nights, however this may vary depending on the season. "My boyfriend and I had an amazing stay at the royal haciendas. Beautiful resort with big pools, beautiful beach with plenty of activities! The staff were all very friendly and helpful! We really enjoyed our stay." "We loved every single thing about the Royal Haciendas. Not one complaint. It wasn't crowded at all, the food was awesome, the pools were awesome, the grounds were impeccable! The 1 bedroom suite was perfect for us, My husband and I, and the 2 teens had their own murphey beds. I would definitely recommend this resort." "Exceptional resort. Clean quiet beautiful beaches. Multiple swimming pools and several great restaurants and bars. Pool bar, hot tubs, hammocks. Entertainment. 20 minute walk to playa del Carmen for more entertainment bars and restaurants." Great discounts, exclusive benefits and other perks only available when booking directly with Royal Reservations. Make plans, relax, book now and pay later, your room will always be secured and guaranteed. Found a better rate? Get the price match plus rewards! Have a worry free vacation!